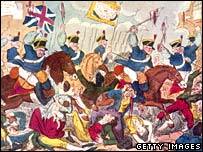 BBC NEWS | UK | Remember the Peterloo Massacre? Amid the lunchtime buzz of Manchester's busy shopping district, a dozen people, dressed mainly in black, made a solemn walk from the city's central library to a building called The Free Trade Hall. There they covered a blue plaque with one they had made themselves, out of paper. They then lay flowers on the ground beneath it. To passing shoppers the ceremony must have looked a little odd. But to these mock mourners it was a vital part of their campaign to highlight the significance of the Peterloo Massacre. They say the small blue plaque, which is the city's only memorial to the 1819 event, is insulting and doesn't even tell the whole story. Charlie Baker was among the protesters: "This plaque mentions a 'subsequent dispersal of the local militia'. "I think having your arms cut off and 11 people dying is little bit more substantial than a dispersal really. We want something put up which tells the story of what happened." The Peterloo massacre, which took place 188 years ago, was a significant event in the history of British democracy. The current blue plaque does not mention the fact that 11 people died or that hundreds were injured. The makeshift paper plaque which temporarily replaced it corrected this. But after two minutes it fell off the wall. The protesters didn't care, as this is just one of the ways they are trying to highlight their campaign to have a bigger more substantial memorial. Paul Fitzgerald, who organised the event, said: "The Peterloo massacre was the turning point in the story of democracy for Manchester, the UK, and also the rest of the world. "It was an extraordinary event. If you like, it was Manchester's equivalent to Tiananmen Square. As a first step we'd like to see the council get rid of this insulting monument to the people who died. "And we'd like something much bigger, like a statue, something which is easily understood by people so they can immediately grasp the significance of what happened. They can look at it and say 'wow, something extraordinary happened here'." And what did happen here was extraordinary. Sixty thousand people gathered in Manchester city centre to demand the right to vote. At the time less than 2% of the population held that right. But magistrates feared there was going to be a riot. The local volunteer yeomanry, described as the "younger members of the Tory party in arms", were ordered to disperse the meeting which resulted in the deaths of 11 people and hundreds were injured. On Thursday, Paul Fitzgerald showed the paper plaque to Jim Battle, the deputy leader of Manchester City Council. Mr Battle agreed that there should be a lasting and significant memorial to the Peterloo Massacre. He said: "My own view is that something should have happened much quicker, but I think there is a will and a motivation and I am glad that people like Paul are coming forward with suggestions. "I'm pretty sure Manchester is a place people will come to remember this important occasion on this site because we will have a tremendous monument here. I think Paul can rest assured that is going to happen." The council announced it would be changing the blue plaque to include wording that would mention the deaths and injuries that occurred on 16 August 1819. The campaigners welcome the news but stress that it is only a first step. They would like a bigger and more significant memorial to an event which changed the course of British democracy.